Research Methods in Physical Activity, Seventh Edition, systematically guides students through the research process, introducing methods and tools specifically for kinesiology and exercise science disciplines, including the subdisciplines of physical therapy, rehabilitation, and occupational therapy. The seventh edition leads students and novice researchers to research competency with the distinctive humor that has become a trademark of this internationally recognized text. This text provides step-by-step information for every aspect of the research process, from identifying and devising research questions to analyzing data and compiling results for presentation. Methods for qualitative, quantitative, and mixed-methods research approaches are addressed, and real-world research questions--including historical, experimental, epidemiological, and philosophical--are presented by scholarly contributors who give suggestions for approaches to follow. Photos, anecdotes, and humorous stories are used throughout the text to put students at ease and emphasize key points through practical applications. Enhancements to the seventh edition include the following: - Updated information and techniques for electronic searches to ensure students use best research practices - New information on meta-analysis and the benefits of journal-style writing that teach readers to evaluate and prepare data for scholarly journals and publication - Special attention to ethical issues to help readers understand the regulations involved in using human and animal subjects - New information on logistic regression that aids in the understanding of complex ideas - Further explanation of qualitative and mixed-methods research approaches, in addition to quantitative approaches, to ensure readers use the most appropriate methodology for their research The content of the seventh edition maintains and expands upon the logical content progression that has made Research Methods in Physical Activity the leading text in the field. Part I presents an overview of the research process, including problem development, preparation of the research plan, and understanding ethical issues in research and writing. Part II introduces statistical and measurement issues in research, and part III presents various types of or approaches to research and methodology from expert researchers in the field. Part IV includes a writing guide for result findings and details how to develop and organize research papers and presentations. Statistical tables and guides are available in the appendix. To aid instructors, Research Methods in Physical Activity, Seventh Edition, includes a suite of ancillary materials featuring an instructor guide, test package, an extra data set for instructors who wish to create specialized learning activities, and presentation package plus image bank. 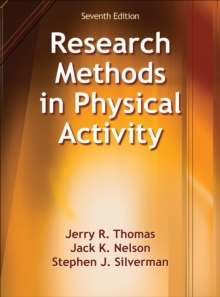 Research Methods in Physical Activity, Seventh Edition, instills in students the confidence to devise, collect, analyze, and present their research in a competent manner by systematically guiding them through the research process. It is an essential text for all emerging researchers in physical activity.